As you may recall, Alex and I wanted to do something big to celebrate the milestone of having reached 10,000 hits. Normally we celebrate such an occasion by forcing each other to experience one of our favorite hobbies or fandoms, but this time, we decided we'd let you, o precious readers, decide which hobby or fandom to tackle next. We compiled a list, put up a poll, and watched the votes come pouring in. Like a half-empty jar of molasses knocked into a bathtub, they came pouring in. We declared we would close the poll either when we got 30 votes or when two weeks had passed, whichever happened later. After exactly two weeks, we had exactly 30 votes. My powers of arbitrary number selection are indeed astonishing. Our options on the table were to watch the first season of the sci-fi show Battlestar Galactica, go on a Ghost Hunters-style ghost hunt, read a bunch of creepy H.P. Lovecraft stories, watch the essential films of Japanese filmmaker Akira Kurosawa, and do a road trip to local tourist traps. I was impressed by how close the results were. In the end, the winner (barely) was watching Kurosawa films, which you chose (I didn't even use my Force powers to influence the vote!). Thus, we will be watching the best and most significant Kurosawa films we can find. I have faith in my local libraries. Seven Samurai, Yojimbo, and The Hidden Fortress are all on the list; feel free to suggest any others. Thanks for voting, and we'll let you know how this all turns out! Ran is also a classic. Sanjuro is sort of the "sequel" to Yojimbo. 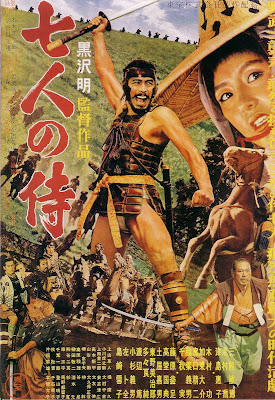 Rashomon is probably one I'd put on the must-watch list before Hidden Fortress; the main reason Hidden Fortress is mentioned is because of the Star Wars angle. We'll put Ran and Rashomon on the list, then, and we'll also put Sanjuro on the list if we like Yojimbo. Hidden Fortress is on the list primarily because of the Star Wars angle; that's one's more out of curiosity than necessity.